Kanemaru is a well regarded in-fighter with over 20 years of experience in the ring. Having debuted for All Japan Pro Wrestling on July 6, 1996, he later found success in Pro Wrestling Noah starting in the early 2000’s. His history of title wins has earned him the respect of legends and newcomers alike. 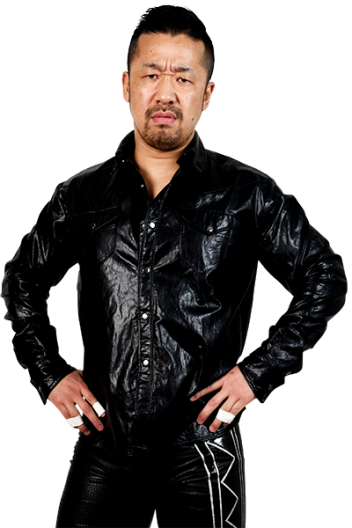 However, in January of 2016 Kanemaru joined the nefarious Suzuki-Gun and quickly adopted a much dirtier fighting style, employing weapons and under-handed tactics regularly. In 2017 he, along with the rest of Suzuki-Gun, started their assault on New Japan. While his mix of technical wrestling, high flying and out of the ring brawling was as effective as ever, he also took a less traditional method of incapacitating the opposition: taking his love for whiskey into the ring and spraying a mouthful in their face. These tactics led he and El Desperado to an impressive IWGP Junior Heavyweight Tag Championship reign over the bulk of 2018 that was the longest in two decades. Kanemaru desperately wants more junior heavyweight gold, as either a singles or tag team competitor, very soon.